This weekend at its D23 Expo, Disney offered several new details about its themed expansion land Star Wars: Galaxy’s Edge. But it was a much briefer announcement, confirming rumors that the company was working on an immersive, themed hotel set in George Lucas’ universe, that offered perhaps the most intriguing hint of where the company sees its parks and resorts businesses going. Basically, Disney wants to build a Westworld for Star Wars fans. In this case, that environment would be a Disney World hotel, designed to look like a massive starship, with views of outer space from every window. 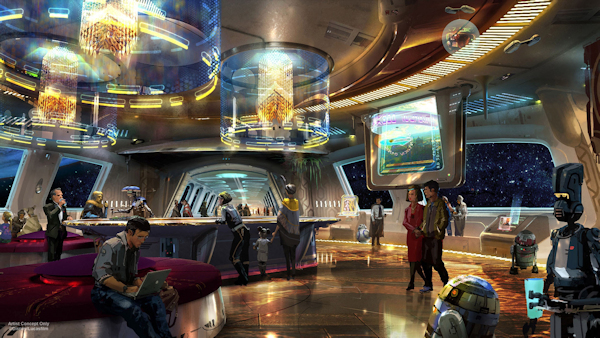 But it wouldn’t just be a place for lodging on the way to Galaxy’s Edge; it would be an area where guests could have actual interactive experiences as part of a narrative storyline. “It will invite you to live your own dedicated, multi-day adventure in a galaxy far, far away,” Chapek explained. Guests wouldn’t wear flip-flops and shorts; they’d wear Star Wars costumes. They wouldn’t deal with hotel employees; they’d interact with Star Wars creatures and droids. And over the course of their stay, the story would unfold around them through a series of story moments and interactions, letting them fall completely into a fictional world. Sure, synthetic humans may not be involved, and Ed Harris probably wouldn’t be poking around looking for a maze. But on a conceptual level, it’s precisely the value proposition offered by the Delos corporation in HBO’s show. It sounds like the ultimate dream for any Star Wars geek or immersive entertainment fan, and while the project is still in development it’s easy to see how this kind of closed-loop entertainment environment fits neatly within the expertise Disney has spent decades building. The company’s Walt Disney World Resort in Florida is already one giant ecosystem unto itself. Check into a Disney hotel, and guests are given a RFID-powered MagicBand that serves as room key, park ticket, ID, and credit card. Shuttles conveniently move visitors from location to location. For those happy to embrace that lifestyle during a visit, it’s a frictionless experience, making it all too easy to escape into the endless array of Disney parks, rides, and restaurants. The building blocks are already there for creating a resort that would let visitors step inside a fictional world and leave everything else behind — just add Star Wars and stir. Immersive environments, in which visitors feel they can actually visit other worlds and have their own adventures, have become vital to the company’s parks and resorts strategy. It’s the central conceit behind the upcoming Star Wars: Galaxy’s Edge, which will let visitors visit a distant space outpost — much like Disney’s new park Pandora lets guests visit the planet from Avatar, or The Wizarding World of Harry Potter allows fans to walk the streets of Hogsmeade. However, Galaxy’s Edge promises to one-up both of those parks by bringing character interactions and a sense of narrative into the mix, potentially turning a guest’s day into a series of linked cause-and-effect moments. But despite the ambitious plans of Galaxy’s Edge, a theme park brings with it considerable logistical limitations in terms of throughput and audience size, both of which are often in direct opposition to the kind of personalized experiences that can make immersive entertainment so intriguing in the first place. When thousands of people are walking through a park, not every single person can realistically have — or will even want — the same level of engagement as the other. An immersive hotel, however, would be inherently easier to scale and tailor to the needs of different visitors, with far more opportunities for guests to encounters characters and story elements. Earlier this year I got a sense of what it would be like to stay in that kind of environment during the Overlook Film Festival, which ran an immersive, horror-themed game over several days. That experience included everything from scavenger hunts in a nearby town to mysterious, 3AM hotel room visits from a recruiting cult, and while the genre was dramatically different from anything Disney would ever offer, it was an exhilarating example of the potential here. Living, sleeping, and eating inside a story is simply tremendous fun, and because people all respond and act differently, every experience becomes unique. With early surveys from Disney floating the idea that visitor adventures could stretch from the hotel, to Galaxy’s Edge, and back again, it’s clear there’s some ambitious ideas being considered that only a resort that operates at this kind of scale would be able to consider. Of course, it’s not going to be cheap, either: that same early survey floated a cost of around $1,000 per guest for a 2-night stay. The immersive hotel concept isn’t being limited just to Star Wars, either. Chapek also announced that Hotel New York at Disneyland Paris will be getting a superhero makeover and turned into Hotel New York — The Art of Marvel. While details were slim, the hotel will allow guests to peruse superhero artwork, costumes, and props “in the style of a contemporary art gallery.” While that doesn’t have the allure of a multi-day adventure like the proposed Star Wars resort, it nevertheless demonstrates that the company is focused on monetizing its rich variety of intellectual property in every way possible. If theme parks are the inevitable future of franchise movies, then hotels, resorts, and every other facet of Disney’s empire are an opportunity as well. If there’s one big-picture takeaway from D23 Expo this year, it’s that Disney is all-in on the concept of immersive entertainment, no matter the medium. From Star Wars augmented reality and Marvel VR, to Galaxy’s Edge and the immersive hotel concepts, the company is aggressively moving beyond the confines of traditional, passive media — and it has both the resources and the intellectual property to pull it off. But of all the different ideas discussed at the convention, the one that felt the most groundbreaking was the one that also sounded the simplest: visiting a spaceship where you can just live inside a Star Wars story, no headsets or clunky technology required. The goal of immersive entertainment is to bring people into fictional worlds and situations; to give them agency and presence in a way that blurs the line between fiction and reality. As escape rooms and these newer, immersive parks have stoked audience interest, Westworld has become the perfect metaphor at the perfect time, cleanly articulating the allure of losing oneself in a “real” adventure. The irony is that the show’s Old West setting seems hopelessly antiquated when compared to the kinds of stories audiences currently crave, and it will likely be a futuristic sci-fi fantasy that will first offer audiences the chance to explore that kind of totally immersive environment. But then again, Star Wars has always felt like a Western.